Now that indie games are getting the recognition they deserve and are so frequently available in bulky, affordable bundles, it’s getting harder and harder to play every game we want to play; there simply isn’t enough time. Fortunately, I did play Defender’s Quest: Valley of the Forgotten, and now that I’ve experienced its unique blend of tower defense and RPG elements, I feel the need to recommend it wholeheartedly to anyone that will listen. This is one game that should not be missed by any fan of the tower defense genre. It’s got characters that level up throughout the game, it’s got a storyline with a beginning, middle and end, it’s got an inventory menu where you can equip your party with weapons and armor, and it’s got spells to cast and a world map to explore with towns full of villagers and shops. But Defender’s Quest: Valley of the Forgotten is a tower defense game; the bulk of the gameplay is about placing your towers—in this case, the members of your party—in positions around the map so that they can attack hordes of enemies that pop out of spawn points and beeline it towards their goal and your destruction. So what genre is this exactly? Well, there are already action RPGs, strategy RPGs and even FPS RPGs, so why not tower defense RPGs? There you have it: Defender’s Quest is a TDRPG, and I really hope to see many more games of this genre in the future. 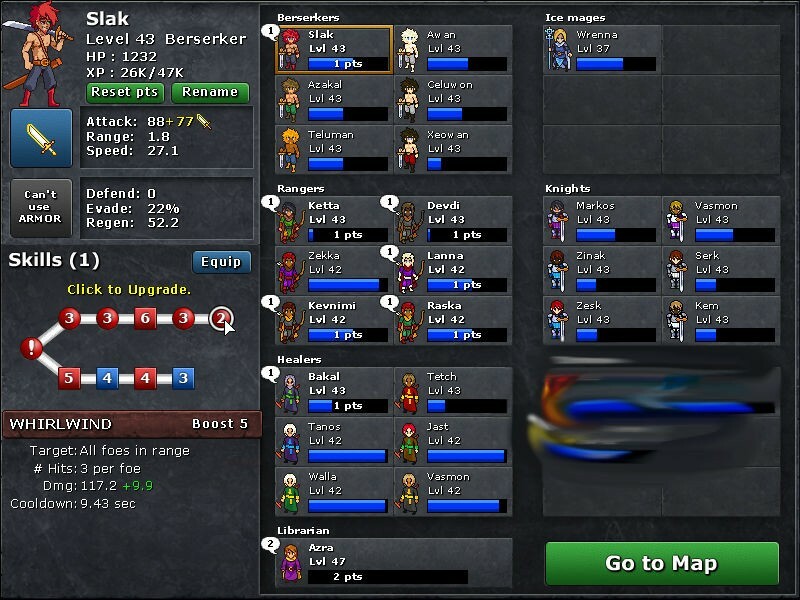 You might find Defender’s Quest similar to other tower defense games where the towers are characters instead of buildings. The closest game that comes to mind is Crystal Defenders, a tower defense game published by Square Enix in which the various classes from the Final Fantasy series are dispatched across the maps to do battle with the endless waves of monsters. Like in Crystal Defenders, the characters you send out to fight for you in Defender’s Quest each belong to a specific class, but unlike Crystal Defenders, these characters are persistent throughout the entire campaign—not just one map. Within each map characters can be boosted up through five ranks that only last through that one level, but after a map is completed, the characters are awarded experience points and can level up permanently. Each level raises stats and awards a skill point. The skill point can be spent on combat skills and passive modifiers that are laid out on a skill tree. Some of the combat skills are not available on a map until the character is boosted up a bit. Up to nine points can be distributed into a single skill, so it’s not only possible, but strategically viable to build your characters into experts of specific abilities. Since you can have up to six characters of any given class, it is fun to see how differently they can turn out from one another, and there’s no reason not to experiment since for a small fee you can reset the skill points for your characters whenever you want. Among the classes are berserkers, who weird swords and are quite proud to charge into the front lines without any armor whatsoever; ice mages, who can slow or freeze enemies in their tracks; rangers, who can attack enemies a long distance away with their bows; knights, warriors who can pierce and even break enemy armor; and one other powerful class that I won’t spoil. The main character who is responsible for summoning all of these characters onto the battlefield is the Librarian, Azra. When her kingdom is stricken by a plague, she becomes infected and is brought to The Pit where she awaits her death. But instead of dying, she finds herself in the Half-Way World, a place somewhere in between life and death where spirits can be seen. In this place she discovers her power to bring people into the Half-Way World, and that is how she calls her allies into battle to defend against armies of Revenant that are all over The Pit. Okay, so it isn’t the most brilliant story in the world, but it is miles ahead of other tower defense games for sure (considering the vast majority of them have no storylines to speak of—Defense Grid notwithstanding). Azra is the target that all of the bad guys aim for, but she isn’t entirely defenseless. When the enemy waves surge and become overwhelming, Azra can cast a variety of magic spells to affect the battlefield, and these too can be improved as she levels up and earns skill points. The most basic trick up her sleeve is a simple lightning spell that damages a single enemy, but later in the game she learns much more useful skills. She can push all of the enemies in the map back a couple of tiles, heal all of her units and even do a lot of damage to all of the enemies on screen. These spells are limited by a currency called Psi. Psi is used not only to cast spells, but also to summon characters onto the map and to boost them up. Characters can be dismissed to restore Psi. Striking a balance between summoning, boosting and casting is one of the more interesting aspects of Defender’s Quest. Slak understands that real men enter the battlefield shirtless. As she battles through the various maps, Azra meets some interesting characters. Each serves both as a plot device and as an introduction to a new class. 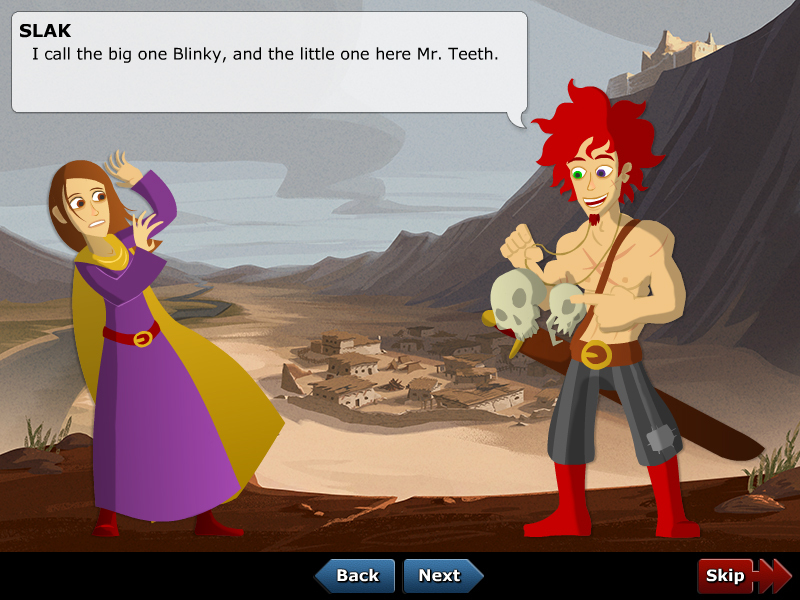 For example, her first ally is Slak, a berserker who is incredibly lighthearted about his insatiable bloodthirstiness. He wants to kill everything in sight, and is happy enough to join Azra and battle everything that gets in front of her. 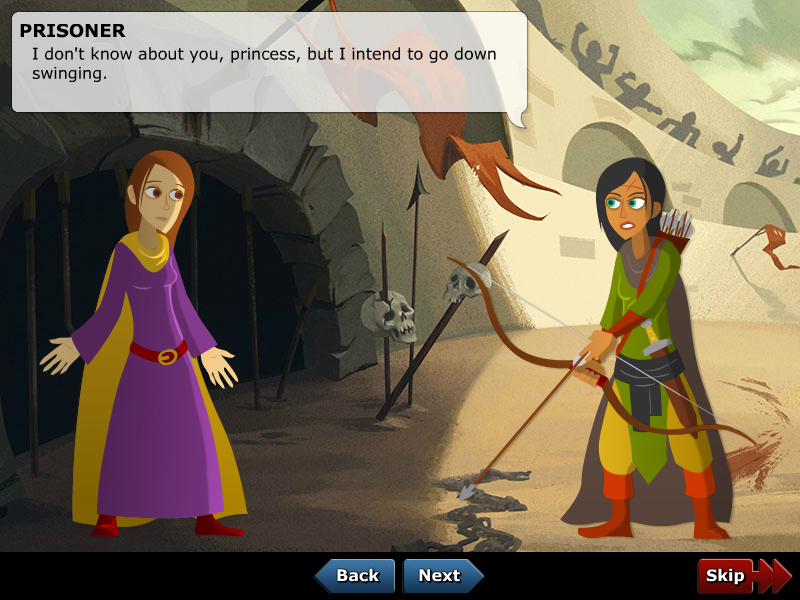 And so Defender’s Quest becomes more and more like a role playing game, with lengthy (text-based) dialogue scenes, complete with character art and backgrounds, and an everlasting parade of reasons to get into more combat scenarios. And speaking of everlasting, Defender’s Quest has a lot to offer, justifying its $14.99 price tag. The game has over 30 stages, each of which has four difficulty settings. There is no enemy scaling here, so the idea is that as you level up a bit and acquire better gear, you can return to earlier stages and try the harder versions of them. This is a great way to earn experience and scrap (currency), but is also the only way to find a lot of unique weapons and armor. Can you earn the gold star on the Extreme difficulty? Doing so can unlock unique gear! As you beat the levels, you earn stars (which are gold if Azra is undamaged), and with enough stars you can access bonus stages. Though the stages throughout the game are relatively short (and can be completely very quickly if you use the fast forward feature), the bonus stages contain many more waves of enemies, and even a couple endless variants, and that’s still just the tip of the iceberg. Beating the game unlocks New Game+, which makes all of the enemies in the game harder and gives them new abilities. But my favorite thing about New Game+ is that it fleshes out the storyline further by introducing the journal. As you play through the game again, Azra writes in her journal, and it really makes things a lot more interesting. It’s absolutely the game’s best writing, and I kind of wish it would have been included in the first playthrough. Beyond that, there are some secrets hidden throughout Defender’s Quest. There is a strange monument hidden in the desert that is covered in a variety of runes. I noticed that each of the runes corresponded to a certain key on the keyboard, and so I did a bit of googling and found out about an intricate password system with hints hidden throughout the game. It’s not quite as elaborate as something like Fez, but puzzle solvers might enjoy exploring the depths of these mysteries nonetheless. Completionists will have their hands full with Defender’s Quest. Collecting all 201 gold stars is no small task. Yes, the levels can be made easier and easier by grinding and leveling up your party, but don’t let that fool you into thinking it is an easy game. The levels scale up in difficulty relatively quickly, and hitting a wall in the campaign is the perfect time to go back and try the harder versions of the earlier levels. And if you want a real challenge, there is nothing stopping you from limiting yourself in certain ways. There is an interesting achievement that requires that you do just that. It is called Hero Mode, which tasks the player with playing the entire game without ever hiring extra generic recruits. Basically you can only use Azra and the other storyline characters throughout the game—thus you only have one character of each class—which makes things much, much harder. And there’s a New Game+ version of that achievement as well. Needless to say, I’m more than satisfied with the quantity of content included in Defender’s Quest: Valley of the Forgotten, but I’m also quite happy with the quality of the gameplay itself. There are great convenience features, like the speed controls, which can pause the game, slow it down to half speed or increase it to 4x when you’ve got everything under control. Then there are the advanced features for each character. By default, your characters will always attack the enemy closest to Azra, but you can change their orders to do the exact opposite, or to target the enemy with the most or least health, or even target the fastest moving enemy. I set my Knights to attack the enemies with the most health so that they would break each enemy’s armor. Then there is a list of toggles that can tell your characters to save their powerful skills for powerful enemies, or to use status effects against the least effected enemy, etc. Best of all, these settings can be saved on an individual basis per character. It’s all very convenient, and it saves a lot of time and reduces the monotony and burnout that is sometimes associated with tower defense. There are even options to adjust the rewards for surviving a map—experience and scrap rewards can each be boosted to 300%! The penalties for failure can be adjusted as well. Normally you only get half of what you would have earned if you fail, but this can penalty can be eliminated entirely or doubled. Likewise, you can affect the rewards for characters that were not deployed on any given map. All of this is great for achievement hunting, and allowing players to play at the pace and difficulty level they want to play at. But more importantly, the game is just a ton of fun to play. Learning the nuances of each class, applying what you have learned to the variety of challenges present on the maps, and taking on the harder levels is great fun. And of course, the role playing game elements add a whole new layer to the genre. I doubt we, as gamers, will ever get sick of developing characters and armies, and Defender’s Quest takes full advantage of our RPG addiction. Of course, this is an indie title, so the visuals leave something to be desired. On the other hand, I was quite impressed by the music throughout Defender’s Quest! Kevin Penkin, who is working alongside none other than Nobuo Uematsu on Project Phoenix, composed the soundtrack, and it is one of the game’s highlights. Kevin must have made an impression upon the legendary Final Fantasy composer, as they will be collaborating on the soundtrack for Defender’s Quest II: Mists of Ruin. I’ll be looking forward to that one, that’s for sure. But for the time being, I’m going to be playing the heck out of Defender’s Quest: Valley of the Forgotten. It proves that the TDRPG hybrid works, defining it brilliantly. 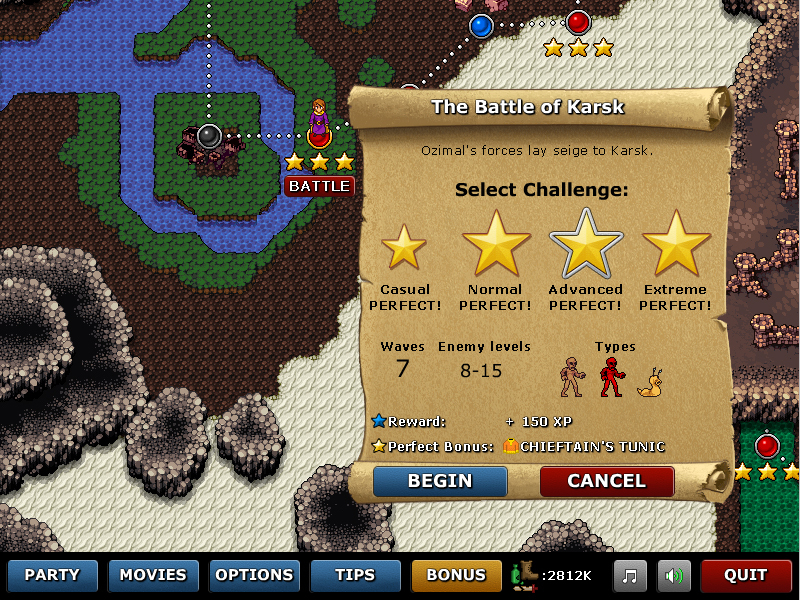 As far as I am concerned, Defender’s Quest is a must-play title for any fan of tower defense games. Granted, I’m over two years late to the party, but better late than never. It deserves a lot more attention than it has received thus far, and I urge you to play it, and share it if you enjoy it as much as I do. Ari completed the normal campaign of Defender’s Quest: Valley of the Forgotten in 10 hours with 64 of 201 gold stars. He purchased his copy of the game on Steam. For what it’s worth, “TDRPG” was literally the game’s original title 🙂 Glad to see the new genre descriptor!